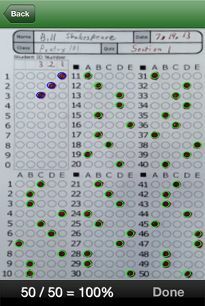 The app basically lets you speed up the grading process by letting you scan the answer sheet with your phone. They have a 20 or 50 question version. There is also a 100 question sheet is in the works, which hasn't been released yet. Once you have your answer sheets, you complete one as a Key. In order to grade it does need a key and you can manually select each correct answer or bubble in an answer sheet and scan it in as a key. Then the process of grading is simple: take your phone or iPad and line up the corners of the screen with the 4 boxes on the outside edge of the bubble sheet. It is important that students be instructed to not mess with those boxes, as there could be a lot of difficulty if they were to eliminate one of those boxes. What would have taken the better part of a planning period, now can take a total of 5 minutes. The app is very accurate and gives you real time data. I have used this since midway through the first quarter and I can likely answer any questions you might have about the app, so please feel free to ask. In the interest of full disclosure I have NOT been compensated in any way by the creator of the application, and I am sharing only to help you improve your professional practice and help you save a bundle of time.